3.5 Thursday Monasrerios to Fuente. We are reluctant to leave Father Miguel's albergue, partly because it is very good but also because the tail of the frontal system lashing the UK is producing heavy rain. 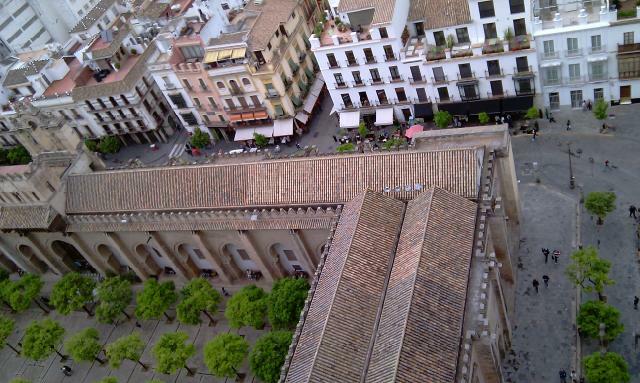 But we set out anyway dodging waterspouts from buildings and find coffee and Tostados in an open bar at 7.15. When we exit it has eased a bit and so it remains most of the day never really stopping with bursts of heavier rain occasionally. The stream we follow for a km or 2 os brimming but the stepping stones when we reach them are still usable. The morning passes in a blur of wetness relieved only by a large flock of sheep grazing across the path followed by a man in a 4x4 who tries to sell us rooms in his hostal in Fuente. 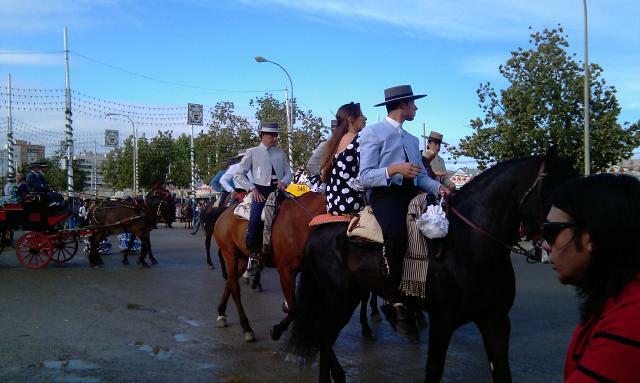 Eventually after a couple of mules (smart beasts) in their shelters we arrive in Fuente just as the weather picks up. Our lodging is the Albergue de Tourismo a converted convent (no nuns alas) a very well adapted building with storks on the bell tower. The church in town not only has multiple stork nests with young but a protected colony of Lesser Kestrels. A t least the weather allows us to wash and dry out. Of Orioles and Big Dogs. 2.5 Wednesday. El Real de la Jara to Monasterio. A very good nights sleep in the quiet lodging at Alofamiento Molina sets us up for a up and down route over the border into Estramadura. The pigs do indeed change colour, we see the soon to be familiar, ginger hairy pigs of this province instead of the bald black ones of Andalucia. Other than the usual herds of milking goats and sheep in the process of lambing with their large guard dogs one of whom is very officious, we see no other mamalian fauna. But the bird life as usual is prolific we see vultures, black kites, a shrike or two, skylarks multiple charms of gold finches and the bird of the day 3 or 4 Golden Orioles. We approach about 2/3 of our distance down the good dirt track and see a large hotel in the distance, this is puzzeling in the middle of nowhere then we discover the motorway it is a service station and hotel restuarant complex, we have coffee and a piece of spanish omlette. The small shrine to Santa Isadore is on the island in the middle of the interchange, the route hops crash barriers to take it in, or maybe we get it wrong. After a confusing bit where we progress between the autoroute and the main road in a small elongated wood we hop some more crash barriers and join a local dirt track that gradually increases gradient. There is a reasonably steep pull up the final slope to the edge of Monasterios, past pig and sheep farms and we are onto the town. We pass by both Hotels Moya and Pilar both advertising pilgrim rates and find the small but new and very comfortable alburgue on the left side of the camino route through town. This albergue opened in Aug 2011 and is the baby of Father Miguel Angel the parish priest and hospitalero of the albergue, (a keen young man) he has a lovely old church probably going back to Roman times, certainly in masonary terms it is a patch work. 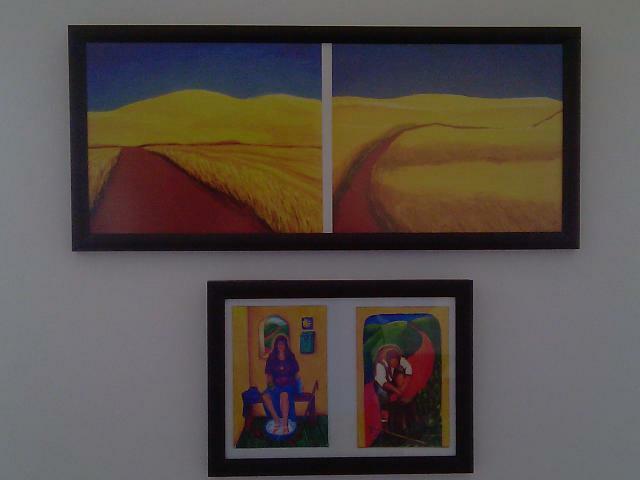 Picture some pics on the wall of the 4 bed room we are in. 20km just over 4hrs with cool temperature and rain threatening all the way. A few more bits about the walk through the oak woods. There were two sizable farms on the yrack both with big dogs roaming free. The first advanced slowly towards us and we did likewise. He sniffed us, we declined to do the same but fondled his ears. This seemed OK and we were allowed through graciously. He then got a little more playful and pulled at a trouser leg but was easily discouraged and lost interest. Later in town we met Joe the Gibralterian, his experience had been similar, the dog basically friendly, however it had mouthed hold of his sleeping bag attached to the outside of his rucksac and run off with it as it came loose. Joe gave chase and eventually regained his kit, to the amusement of the farming family watching over breakfast. He got a cup of coffee as recompense. 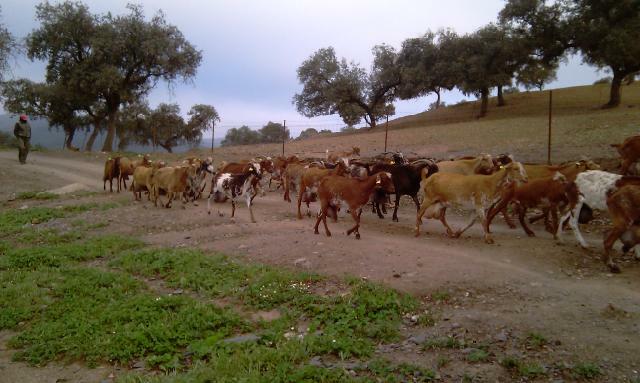 As we passed the second farm we stood aside while the large herd of goats went to be milked and were impressed by the large numbers of black andalusian pigs on the farm. Tony says the colour of the pigs changes as we go over the border to Estramadura. He is unable to give references to this and as he may have written some Wikipaedia entries the rest of us have doubts. However there was a very hansome sow just below the castle close to the border, wat h this space! Yesterday we met a born and bred Gibralterian on Camino. Among the wealth of information he has, is the fact that the weather, having been dry, is now unseasonably wet which accounts for the large quantities of flowers just starting to bloom. Todays wander is either short or too long. 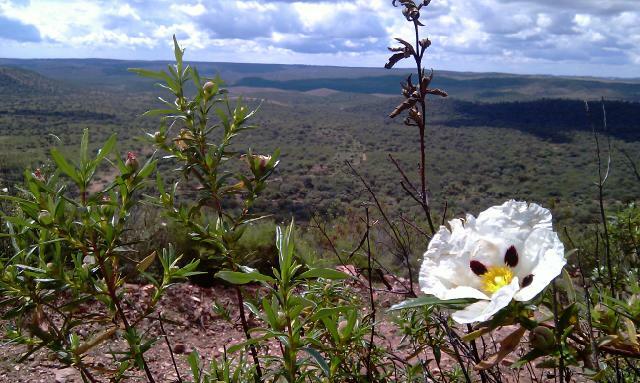 We are still within the Parque Natural Sierra Norte and the track we take within a km of town is undulating through managed cork and oak forest. It is rocky scrub at first but eventually a significant uphill, sorts sheep from goats, both of which are producing milk/cheese from forage acorns and scant grass in these woods. Hoopoes are hooping on either side and these occasionaly cross our path with the newly identified azurewinged magpies. The rough path settles to a good dirt track and descends into Real de la Jara having passed several pig farms of the black Andalusian sort for producing the cured legs the area is famed for. We are within sight of its old castle (to protect the village from Moors or Christians depending on point of view) by 10.30 and as we enter the village we are dragged into a hostal just past the albergue that is not yet open to view rooms. Competition appears fierce in the town for pilgrim custom. It is a Mayday holiday but we find further into town a room at hostal Molinas (which has more than one bathroom for 10-12 potential guests). We would go further but the next stage to Monasterio over the border in Extramadura is over 20km and Betsy blames last night's poor sleep in the albergue in Almaden for her lack of stamina after a mere 13km (and asked for a coffee free morning to be taken into consideration too!). We are all happy though, to stop early and have a look at the castle (and the storks). 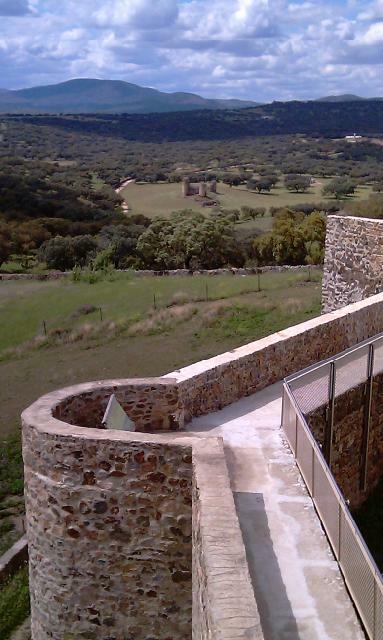 The castle has been restored with an EU grant and was a significant fortification in the 13th C when it defended its strategically important hill against variously, Moors, Christians and the King of Portugal. The views are excellent over into Estramadura just a few km away over a river. A walk in the park, plus Calvary Hill. 30.4 Monday Castilblanco de los Arroyos to Almaden de la Plata. It's not raining, just cold and clear when we leave Castilblanco a nice little town with a very average albergue, redeemed by the good cafe/bar opposite (open around 6.30 for breakfast. It is just light after breakfast but we do not see any of the seven pairs of storks nesting on and around the church some of whom we saw changing the guard yesterday. Our route today starts with a 16km road walk which in fact passes through very pleasant countryside undulating through olive and cork trees. The road is good quality but relatively little used by vehicles so the walk is good and we learn to identify the call of the hoopoe as well as seeing a dead one at the roadside. We also get good views of the bird that yesterday we thought might be a greater spotted cuckoo, it is not! We later identify it as an Azure winged Magpie, they seem quite common here. We are rising slowly and some clouds form as the sun rises preventing the day from warming up so we bowl along at a good speed and soon reach the entrance to Parque Naturel de Sierra Norte, a good gravel track leads through. In the air above the large area of cork oak and scant pasture we see a stack of over 10 vultures rising on a thermal to look for food. We hope to get out of this area without providing their next meal. The final route out leads up the very steep slope called in our guide books as Calvary Hill it is steep but not really very long and the views back are excellent. We descend the hill into Almaden which is quiet as it is a holiday. Good albergue after 28km 6hrs. Guillena to Castilblanco de los Arroyos. A short day. We wake to a reluctant alburgue, it is raining again, a collective sigh and a rustling of water proof nylon and we are off like herons leaving a roost. We leave an excellent welcoming alburgue. Jacqueline runs a fine place, even when full, turning no one away, even the unfortunate muddy late cycliste with no pilgrim passport because the cathedral office in Seville is closed on Saturday for Ferida. We race along like yellow arrows for 3km to the cafe/bar at the turn off the road onto the dirt road, and stop for breakfast tostados with honey and cafe con letche. 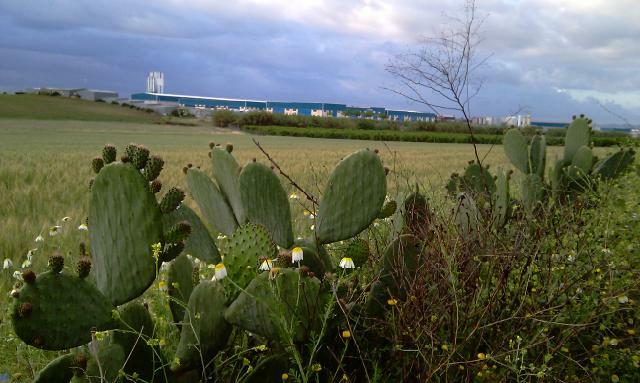 The next few km is unpleasant, though with good views back to Seville over the young catus hedge. The fertile soil of the olive groves and corn fields is also the ground for the dirt track, it clings, the rain though now light, has produced a perfect consistency for scones and it sticks to the bottoms of our boots slowing the going. As we rise, yes a hill for the first time this camino, we enter a natural park area of chaparal and with the shallow rocky soil the going gets much better. This is a lovely walk it's good even in the rain, we see a hoopo a flight of herons, and a curious black capped cuckoo like bird, the bird book suggests the great spotted cuckoo, available in this area, frequenting olive groves and scrub and a nest predator on magpies, so this seems a possible new bird for us. However in the main the avian fauna is yrying like us to avoid the rain. After too short a time we join tarmac again to a crack of thunder and a brisk downpour before reaching Castilblanco. The alburgue is well signed and open the lady cleaning is just finishing and we put sacks on beds and repair to the El Algabeno bar opposite the petrol station in front of the alburgue for an excellent meal of the day. The soup in particular impresses Tim, so much with so little (a light chicken stock with italian pasta noodles and occasional chickpeas but served onto a sprig of mint flavouring the whole perfectly). Can you tell Stork from*****?*. 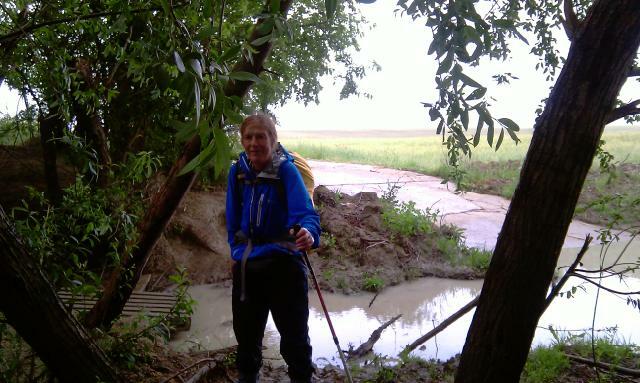 We bid farewell to Ray and Anne, both of whom have enjoyed their dip into a Camino. The rain on the roof of the hostal sounds heavy to all except Tim who wonders why there is suddenly no rush to start and is bemused when Tony starts to put on overtrousers. Eventually we all leave into the raindark streets to find after a few turns the trail of yellow arrows past the office of the Amigos de Camino across the river to the west and past Decathalon (about600m off route) where Tim markedly improved his footwear yesterday. We gradually leave the river and it seems quite soon reach Santiponce where there is a reconditioned monastry and more importantly to us a coffee. The rain is very slight now, but Betsy discovers her old overtrousers are permeable to water. We pass by the Roman ruins and the mock roman marble carvery and after the large trafficisland ee take to the straight track to the fields. As we approach a pylon topped by a storks nest one flies in, up pops its mate and we witness the changong of the guard and possibly feeding of a small one in the nest, though this we cannot see directly it appears to be what the incoming one is now doing. Later a line of five occupied nests along the power lines and a flight of herons gives an excuse for jokes about stork and butter. Sauntering on for we have not far to go today, we come to the warned about ford. It looks deep but some strategically placed palettes provide a route across that would become inadequate in wetter weather. And so after another, somewhat smelly stream we enter Guillena. Menu de Dia at the Bar Frances is adequate and cheap by Seville standards we have arrived in Camino Spain! At 1400 the alburge is opened by Jaqueline the french guardienne and we check in gaining a sello and points for carrying our own washing lines. A day with the oranges. We are based in Triana Backpackers on Rodrigo de Triana, the significance of the name is that he was the man in the crows nest on board the Santa Maria who first sighted America or at least which ever Carribean island was spotted first. From here we explore Seville crossing back over the bridges from Triana to the cathedral. It is a huge pile of carved stone with a lot of silver inside, we get our sellos (stamps) at the admissions desk and file round. The tomb of Christopher Columbus retrieved from Cuba before the revolution and the enormous height inside. The building is on the site of the previous mosque and the bell tower is two thirds minaret with the orangery also remaining from moorish times. The rest is Gothic and designed by the same man as Rouen cathedral in France. We have some lunch in an inn it is claimed Lord Byron stayed at and climb to the top of the tower. Tomorrow Ray and Anne fly home and we start the walk in earnest. Hopefully without too many days like yesterday. 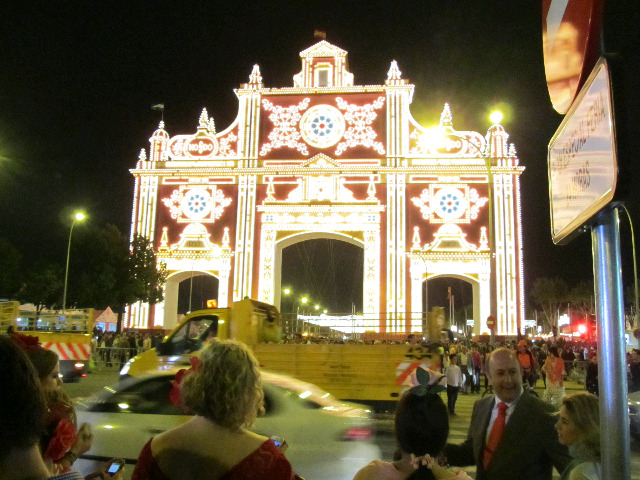 We recover in Triana Backpackers, and head out to see what this Ferida is about. There is a fun fair but this is the least of it, the main part is to see and be seen, preferably on horseback or in a carriage. There are some beautifully kept animals not only horses but also teams of mules very fine beasts with a long suffering air. 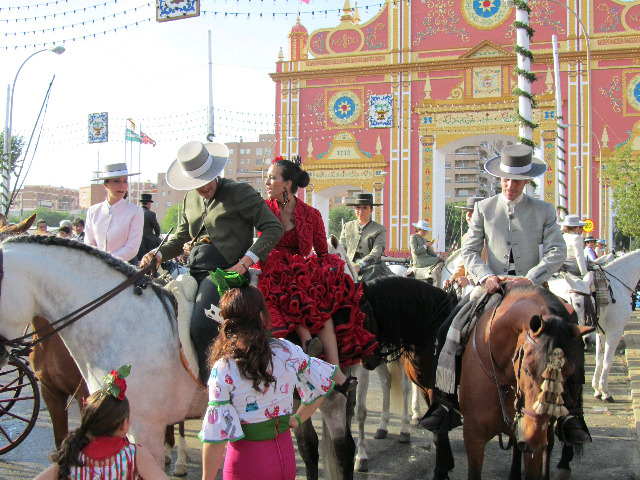 We think there are large tents hired by wealthy locals or organisations to which one is invited and might attend by carrige or parade on horse back, preferably with wife or intended side saddle on a blanket behind the caballero. 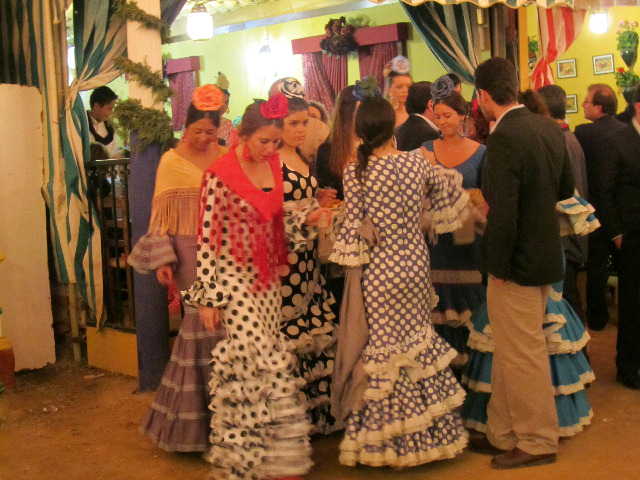 All very colourful quite apart from the flamenco style dresses. 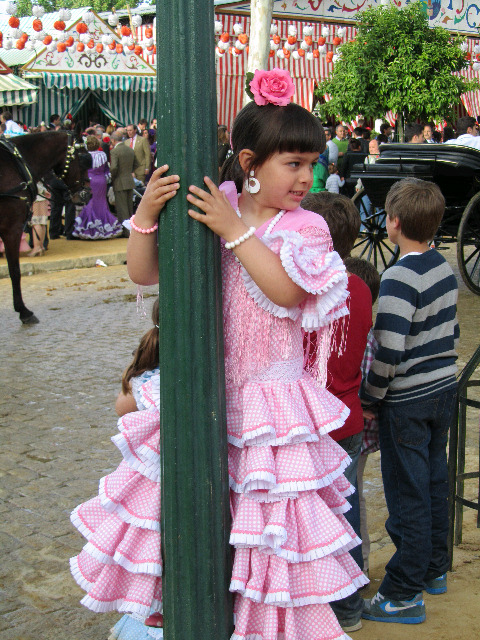 Just as well we have another day planned in Seville an early start tomorrow would not be on.